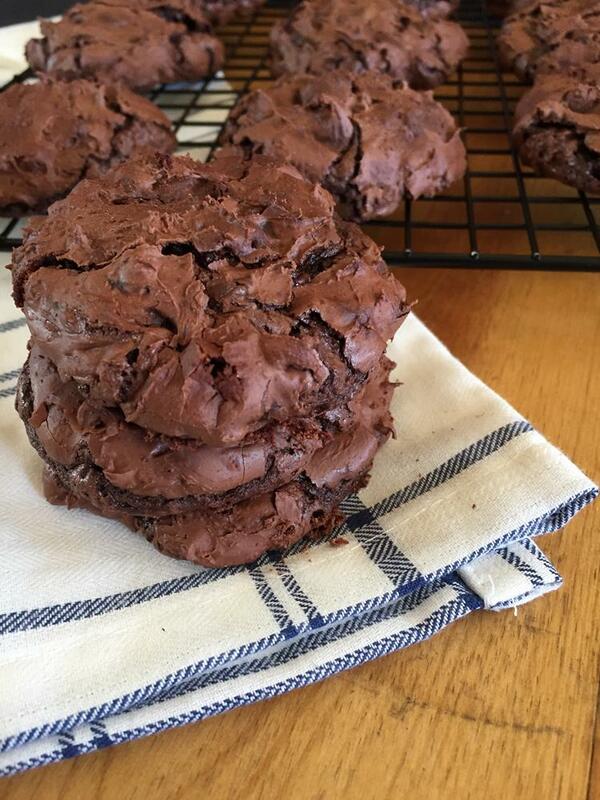 These flourless chocolate cookies are so good. I love that they are flourless because that means they are gluten free. I know that you might not be gluten free, but these cookies are regular food that just happens to be gluten free. You don’t have to be gluten free to enjoy these and they don’t contain any odd ingredients. They are just regular food that is gluten free. Gluten free eaters and non gluten free eaters will enjoy these. I love how simple, but delicious these cookies are. I have made them many times over the years. The basic recipe is one I shared years ago, but I have adjusted and changed the recipe over the years and knew that it was time to share the updated version with you. 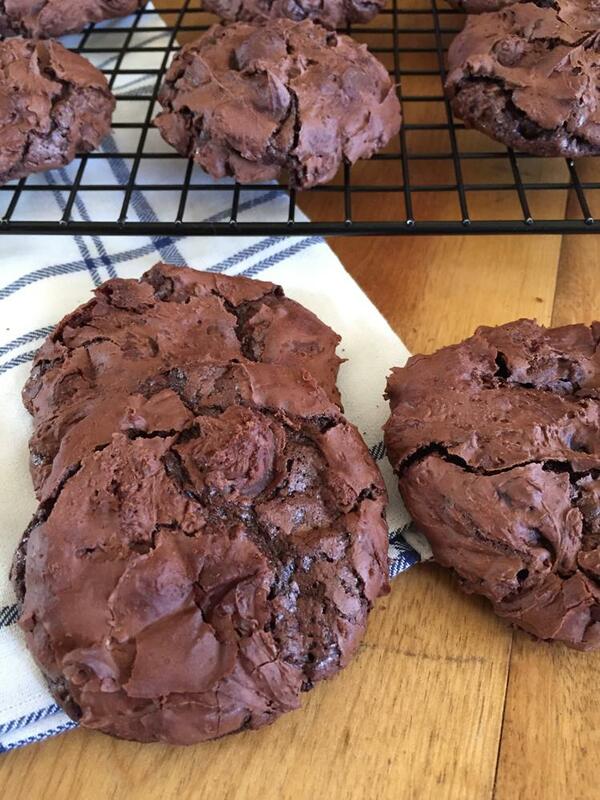 These cookies have a fudgy texture. They are kind of like a brownie cookie, but slightly different. Be careful not to over bake them. You want them done, but still soft and fudgy. These cookies are great just like they are, but I have also added a little coconut to these and we really liked that version as well. Mix together sugar, cocoa, cornstarch, and salt. Add eggs and mix until well combined. It will be a thick batter and may take awhile to mix completely together. Drop onto cookie batter on to cookie sheet using about 2 tablespoons batter per cookie. Bake for 17-20 minutes. I know this is a wide range, but check them at 17 and cook for a few minutes more if needed. Let cool about 5 minutes and remove from cookie sheet and finish cooling on a wire rack. If I am not mistaken, powdered sugar has cornstarch in it, right? Would that not be a flour of sorts? Love your site! By flourless I meant the typical regular wheat flour. And usually in gluten free baking cornstarch is not considered a flour. You have rice flours, and potato flours, etc, but cornstarch is not usually considered a flour unless it is part of a blend, although it is used in place of flour. But for this specific recipe by flourless I meant the absence of wheat flour. I hope that helps. I think they might work well for a crust if you cooked them a little longer so that they would crisp up a little. I have used other gf cookies as a crust and it worked well. I made a similar recipe before Christmas and they were amazing! However, as normal, your recipe looks simpler and yummier! (I had found the other in a magazine.) Thanks for sharing! I hope you enjoy them. There are a lot of versions of this basic recipe, but this one is our favorite. These are delicious! Perfect cookie for a chocoholic like me – definitely a 10 out of 10! I made exactly as the recipe stated except for the salt – I used 1/4 tsp. of sea salt since that is what I had. 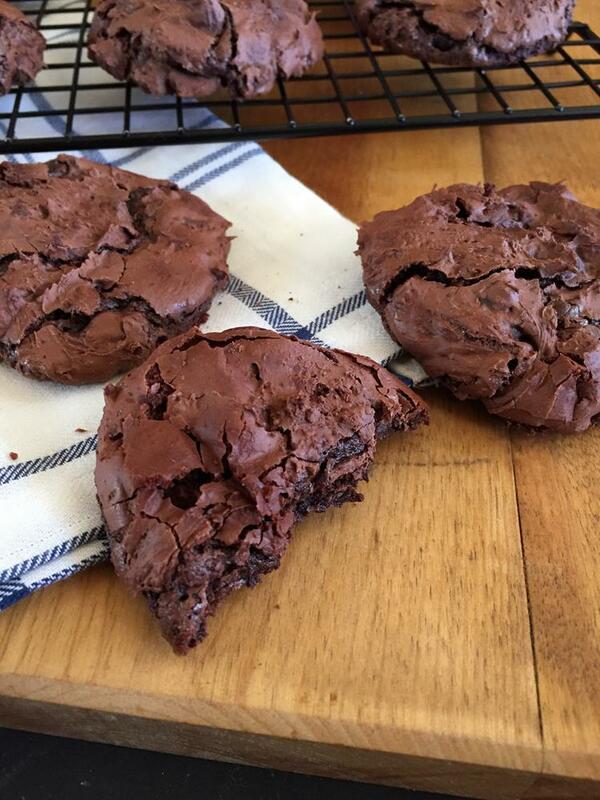 I was worried at first because I used my stand mixer to mix and the batter seemed more like brownie batter consistency, but the cookies baked to perfection just like in the picture. Thank you Lynn! I am so glad that they turned out well for you and that you enjoyed them! Thanks so much for letting me know. They are one of my favorite so I love hearing that readers love them too. Have a great day!